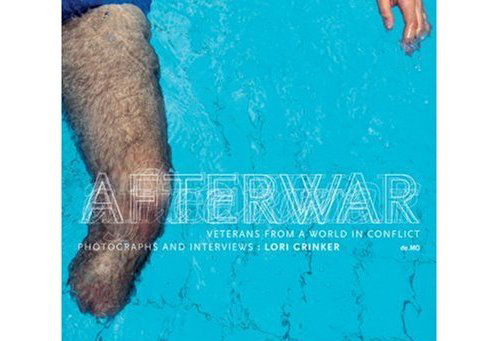 Afterwar: Veterans from a World in Conflict is a culmination of 15 years spent photographing and interviewing men, women and children who have been on the frontlines of every major conflict of the past century. It is a portrait documenting the deep physical and psychological effects on the veterans whose bodies and minds are changed forever. It is not the “politics” of a particular war that the people in this work represent, but rather a portrayal of our culture of warring and the aftermath of war in human terms. Organized in reverse chronological order, from the most recently ended conflicts to the early part of the century, the book includes Sri Lanka, Liberia, Northern Ireland, Bosnia, Israel-Palestine, El Salvador, Cambodia, Eritrea-Ethiopia, the Persian Gulf, Afghanistan, Lebanon, the Falkland Islands, Vietnam, the Middle East, Bangladesh, Malaysia, Algeria, Indochina, Korea, China, World War II, Spain and World War I.
Lori Grinker, born in 1957 in New York, is a member of the photo agency Contact Press Images. Her social-humanistic work has taken her to the Middle East, Southeast Asia, Eastern Europe, the USSR, Africa and throughout the United States. Her work has been featured in Life, The New York Times Magazine, Newsweek, People, the Sunday Times Magazine(London), Stern, GEO, French Photo and American Photo. She is the author/photographer of The Invisible Thread: A Portrait of Jewish American Women.